Horses are large fast-running mammals. Commonly found in family groups in wild Prairies and mountain tops. They feed on straws and hay stacks. Horses are herbivores and carnivorous depending on what they are raise to eat. Horses are also commonly raise by farmers for racing, guidance, shows and other activities their racers may find fit and appropriate for them. They perform during police officers’ match pass as well and frequently use for riding chariots during weekends. When well trained, they comprehend and keep with directions set forth for them. Racehorses can gallop up to about 42 mph (68 kph) in short bursts in order to escape from predators. The horse’s life span is about 20-35 years. Horses were first domesticated by people in Africa 5,000 to 6,000 years ago. 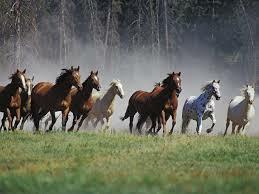 There are about 200 domesticated (not wild) breeds of horses. The earliest-known horse is the tiny Eohippus (Hyracotherium). Anatomy: Horses have hoofed feet (they are ungulates). The hooves and teeth continue to grow throughout the horse’s life. Horses have a narrow, flowing mane. They have large nostrils that let them get lots of air quickly. Large eyes and ears help the horse detect predators early, allowing it to run away. The heaviest horse is the Belgian (up to 3,150 lb,1400 kg), a draft (working) horse; the tallest is the Percheron (7 ft tall), another draft horse. The lightest and smallest is the miniature horse, a type of pony.